You might not need to use Shazam next time you listen to a really good song while ordering your Pumpkin Spice Latte at Starbucks. On Tuesday, Starbucks announced another exclusive partnership with Spotify, which will allow customers to save the music they hear in stores as a new form of discovery. The Starbucks mobile app now has a dedicated section devoted to telling you the music that’s currently playing in a Starbucks store nearby. The section lets you save and listen to the songs anywhere you go by connecting to your Spotify account. You can also browse the store’s previous playlists to see which songs are on rotation. You can access this new section in the Starbucks app by tapping on the “Now Playing” banner at the bottom of the screen. 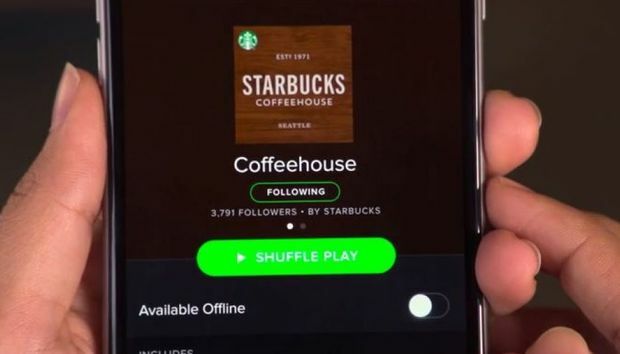 This new mobile music feature is available in both iOS and Android versions of the Starbucks apps, and currently more than 7,500 U.S. Starbucks stores are participating in the Spotify-dependent program. It’s funny to think of a chain of coffee shops as the “world’s largest stage,” but that’s our smartphone-powered connected world for ya. Previously, Starbucks has sold CD’s and given away free iTunes tracks. In 2015, Starbucks went all-in on streaming music by signing Spotify as its official music partner. Starbucks kicked off the partnership by giving all of its baristas a premium Spotify account so that they could help pick out music and create “Store Favorites” playlists. With this new upgrade, customers will also get to influence what music plays in-stores by “loving” their favorite songs on the Starbucks app. As for Spotify, the music service has also nabbed exclusive partnerships with Uber and Virgin America to allow people to stream music while getting from point A to point B, whether that’s via car or airplane. Impact on you: Unless you already use the Starbucks app to monitor your loyalty rewards points, this upgrade (albeit super-cool) might not be enough motivation for music lovers to download the coffee chain’s official app over something like Shazam, which identifies songs playing in every store and already has a built-in connection to Spotify (and other music streaming apps) so you can save tracks and listen to them later.